Honing can best be defined as a process in which an abrasive elements removes material from another element by the action of pressure and movement between thoise two elements. 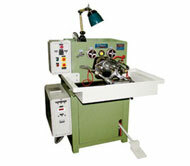 It is fast stock removing process capable of producing components of very high accuracy. The abrasive element is usually composed of grains of Silicon Carbide and Aluminium Oxide graded so that they are all of a particular size and then bonded together to honing sticks. The object of honing is to produce a specified surface finish, a particular size, roundness, straightness and parallelism of hole. To achieve this end, abrasive element must be pressed against the hole surface in such a way that geometrical are rapidly removed.